Miracle Valley Vineyard property has been a cattle ranch from the time of the early American Revolution, through the Civil War, all the way up to the late 1980s. The land and all of its buildings lay unused, until 2004 when the owners of Miracle Valley purchased them. The land is rich in history, from early American Indian days till the present. It has always had strategic significance through out history because it has underground springs that converge into one stream to give a continuous source of fresh water to the inhabitants. Here is just a short summary of some of this history. 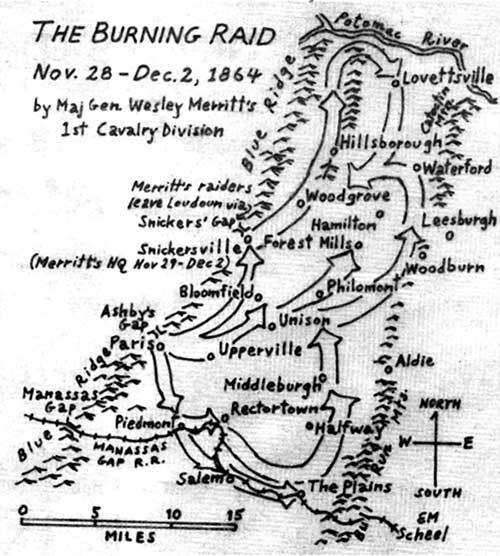 Several thousand Union soldiers raided northern Fauquier County from Nov. 20 to Dec. 2, 1864 in what has been called The Burning Raid. The destruction they wrought upon the civilian populace and farms was unmatched during the Civil War. Ruins of burned buildings remain today. Ulysses S. Grant, general in chief of the U.S. armies, stated the purpose of the raid in an order to Major General Phil Sheridan on august 16, 1865. "If you can possibly spare a division of cavalry, send them through Fauquier County to destroy and carry off crops, animals, and all men under fifty years of age bearing arms. In this way you will get many of Mosby's men. All male prisoners under fifty can fairly be held as prisoners of war, not as citizen prisoners. " On Nov 28 Sheridan sent Major General Wesley Merrit's cavalry through Ashby's Gap to begin a week of destruction in Fauquier. His orders were simple " You will destroy and consume all forage, burn all barns and mills with the contents and drive off all live stock in the region". The 1st Brigade under Colonel Peter Staff was dispatched south to Piedmont Station(present day Delaplane). The full scope of the raid was captured in a map(shown above). The bottom part of the map shows a major thrust by the 1st Brigade from Piedmont(Delaplane) through Salem (current day Marshall. The land upon which Miracle Valley sits was right in the middle of this attack. Evidence of this raid can still be seen at Miracle Valley Vineyard. The only thing that is left standing from the pre-civil war grain barn is an old foundation. In the past the owners of Miracle Valley have been made aware that John Mosby's used Little Cobbler and Big Cobbler Mountain for his flying artillery from Salem(Present Day Marshall). In addition to structural damage to the barns at Miracle Valley, civil war mini balls have also been found around the property. The top grain barn was never rebuilt as can be seen in the photo to the left. However, the lower barn was rebuilt in Sept 1920. We know this because the farmer that rebuilt the lower barn carved this date into the cement that was used to rebuild the grain silo. We believe that the spring house was rebuilt soon after the raid of 1864. The owners of Miracle Valley took great efforts to preserve the historic buildings. It was very important that the character of the old farm be preserved. The old farm house was converted into the Tasting Room, one of the old stables was converted into the wine processing facilities and an old barn still stands as winery equipment storage in the rear of the farm. Come to Miracle Valley and explore the history of the place.